I’ve just started a new research project for which we need a visual identity – and this time that’s doubly important as the project itself is about visualization. [I’m looking for] a suitable logo idea that can serve to highlight what Johanna so aptly emphasizes in “Graphesis”: the importance of thinking about visualizations as a genuine epistemic and explorational device rather than a mere representational instance of ‘data’. I came across Johanna’s mention of Kandinsky’s “From Point and Line to Plane” on p.35 in “Graphesis” and was immediately attracted by Fig.98 in the right hand margin: For me the vertical line touching the upper border signifies a subtle transgression of the idea of visually supported dualism as it pulls the reference plane within the square and that of the perceiver notionally situated outside the square (if you wish, the discourse plane) together and brings them into contact. I accepted the job and set to work. Identity design is in large measure typography, and typography is often a good starting point when creating a new logo. For this project I decided to start from the genre of decorative typefaces known as ‘shaded,’ as these invoke a sense of 3-dimensionality. As design briefs go, the above requirement is definitely one of the tougher assignments I’ve seen.¶ I wonder if it could be solved through a bit of playfulness. 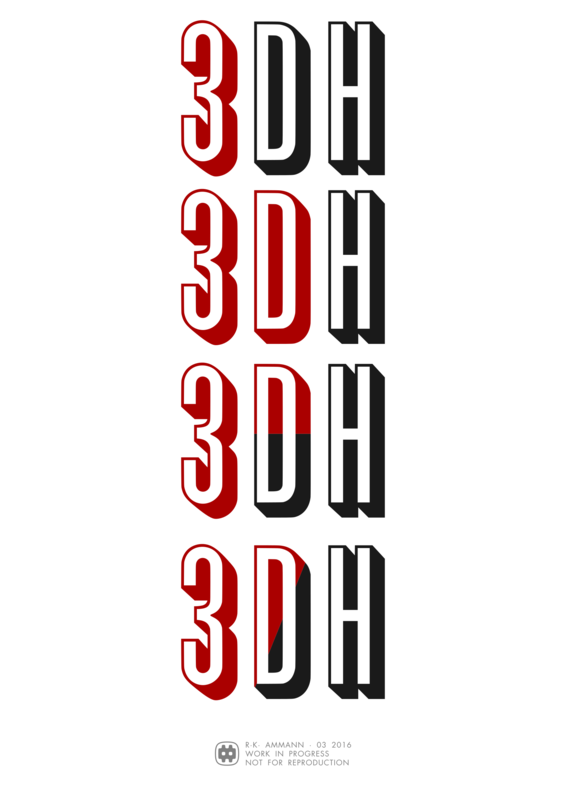 Let’s start with the project name: 3DH. There’s a quibble to be had from this name as to whether the 3D or the DH part should be the privileged reading: the D is ambiguous, therefore in need of interpretation. I’m wondering if the concept of parallax could be built in here to go “beyond representational concepts of visualization”.¶ Unfortunately, most diagrams of parallax are pretty reductive. 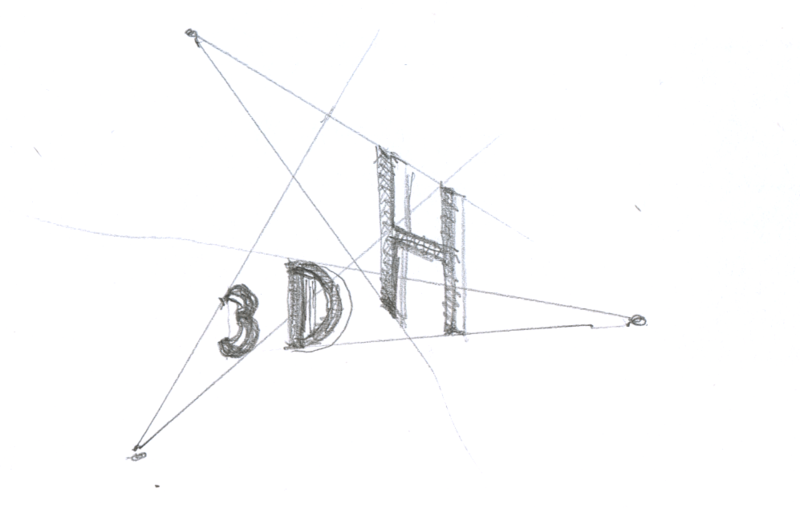 But if you could imagine the 3DH logo you’re playing with constructed from two points of view or scales and have them not match but still relate–sort of like extending that diagonal slice through the D in the fourth version of the logo, but so that it refracts the letters. I would suggest lightening the design as well so it is not quite so solid/architectonic. She illustrated her idea with a number of hand-drawn and scanned sketches, collated into a single PDF. A diagram consisting of conceptual space mapped out by thin lines and inhabited by typographic elements at comparatively small size is in danger of looking ethereal and anaemic at small scales, especially when displayed next to more conventional logotypes. I wonder if we can work with that ambiguity and an indication of non-identity or non-similarity between the two meanings of the “D” in the acronym. That could introduce the parallax issue in some way. 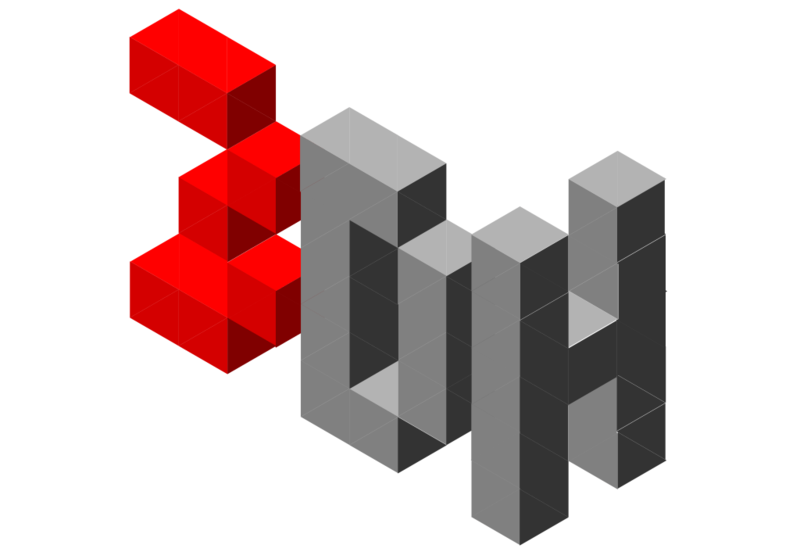 Attached as well is another take on the same idea expressed in a 3×5 pixel font rendered 3D in axonometric projection (channelling my inner Max Bill here). 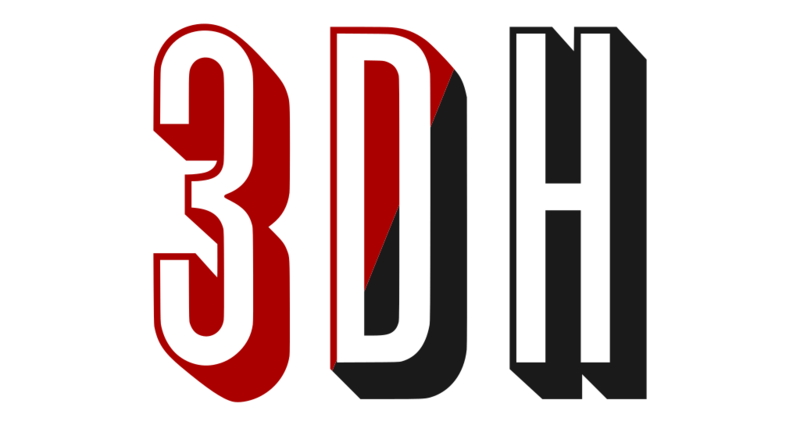 The piece turns on the ‘ambiguity’ of the D again, as the letter associates with the 3 in its orientation but associates with the H in its colour. it creates a weird Escher-like paradoxical n-dimensionality that loops onto itself and makes it, how shall I put it, “performative” in that you simply cannot stop re-processing the image. Playing on positive/negative space, unlike the parallax idea, was something I knew how to handle. I wasn’t very keen on the idea because it seemed to offer less scope for the play on the letter D, but I pursued the idea anyway, resulting in a few iterations that struck me as nicely done but showing little relevance to the design brief. I’m going back to your sliced “D” idea and seeing if I can play with some parallax in it. 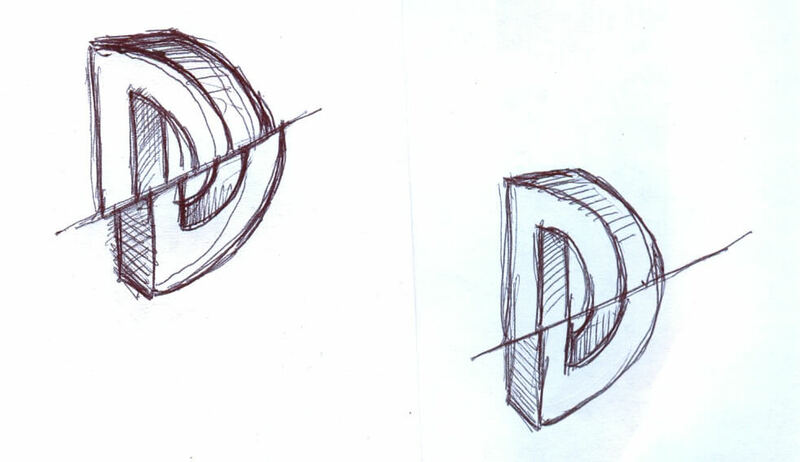 I returned to a few recent Escher-inspired retail typefaces and examined them under the aspect of whether the two yoked-together perspectival components of the D might be coloured different to convey the ‘ambiguity’ of the letter. I put this through a few iterations until it occurred to me that I could vectorise Johanna’s D sketch and use it in the same fashion.¶ Which I did as a rough and ready first cut.¶ Please find the whole series also included in the zip. Don’t worry about the grey/white/yellow colour scheme just yet.¶ I think we have a candidate here. The attachment included two pieces that would form the basis of the eventual design. Oooohhhhh! I am really loving these. I have my favorites, but will hold off until others weigh in. SUPER!!! We are really getting close, I think. Elegant, too!! Wow, Rudolf,¶ this is really a leap forward! Things took a curious turn at this juncture: Johanna never came back to name her favourites among the Escher batch, whereas Christoph and I focused on the version of the design using Jeremia Adatte’s Bron Black typeface. Oddly, we both shared the concern that the 3 character looked like Homer Simpson‘s face, and that it required a modification to its shape. I also developed an obsession with searching for ‘impossible object’ typefaces and, telling myself I was doing my due diligence, went through as many such typefaces as I could find. And it occurred to me that we could bake the yin and yang motif into the design by not just making the D the location where the two colours cross over from one to the other; in addition, both of the other characters could have their respective main colour counterpointed by a small included segment of the opposite colour. I think we’re about to reach design freeze! This has been REALLY fun! And so fast! However, still unresolved was the question of what the colours would be. One possibility, perhaps the obvious one, was to rely on shading, which is conventionally used to evoke the physicality of a three-dimensional object in two dimensions; we could render the design in a local colour and a corresponding shaded hue. 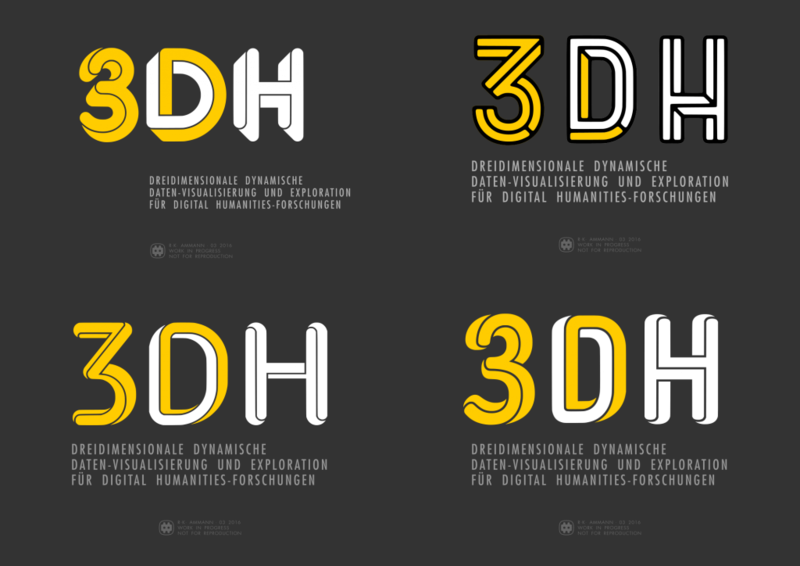 28 March 2016: Coloured instances of the design based on the Bron typeface. I have to consider internal politics and strategy: I would appreciate if we could either use Hamburg University’s color scheme (see https://www.uni-hamburg.de/) or one that resembles that of the City of Hamburg (which includes blue: see http://www.hamburg.de/). These are my funders who I need to get on board as co-owners and I want to make sure that they, too, will be able to identify with our project. I objected to the adoption of Hamburg’s colour scheme, but Christoph insisted and asked for a draft of the logo, so he could attach it to a mailing to the project funders at the end of the week. In response to this request I started to look for ways to colour the design red and blue. We seemed to have arrived at the end of the process now. Yet by that point I also nurtured a growing sense of dissatisfaction. It vexed me that we were merely going to apply a minor tweak to a typeface and to play a game with colours that seemed too clever by half while failing to state the design’s basic idea with any clarity or forcefulness. I attached a few revisions of the earlier piece. To accommodate Christoph’s wish for Hamburg styling, I adopted the colour scheme specified in the branding guidelines of the City of Hamburg [PDF] and modified the typography. Throughout this project, I had been using the Futura typeface as a nod to the Bauhaus aesthetic, following Christoph’s mention of Kandinsky during the earliest stage of the collaboration. As Universität Hamburg’s branding guidelines specify TheSans of Lucas de Groot’s wonderful Thesis family of typefaces, I happily switched from the geometric sans serif to the humanistic sans serif. I really love these […] the larger D in the center with the real dimensionality to it is terrific. Escher-Drucker it shall be. It’s leaner, less self-absorbed and elegantly accentuates the dynamic D as a perceptual and intellectual axis. This version was adopted, then, and made it into the mailing. With the site coming online in early April, I implemented the logo and the Hamburg colours in a lightly modified version of the content management system’s GeneratePress presentation layer. And this is how it all got that way. Rudolf Ammann is chief artist of the Arkstack consultancy in London, UK, and designer at large of the UCL Centre for Digital Humanities. Prior discussions of his identity design include the PanoptiCam logo.